The profit of state-owned oil and gas holding company Pertamina has reportedly dropped to less than Rp 5 trillion (US$335 million) in the first half of 2018 from Rp 18.73 trillion in the same period last year. Coordinating Minister for Maritime Affairs Luhut Binsar Pandjaitan said a number of electricity infrastructure projects in Java Island would be postponed in the wake of rupiah depreciation against US dollar. The Central Java Police have prepared around 2,500 personnel to disband an upcoming sporting event in Kota Barat square they believe to be part of a political movement against President Joko “Jokowi” Widodo. One of the standout commodity performers this year has been thermal coal, but not all coal is created equal and disparities in pricing may help explain why India’s imports have stayed strong despite the higher costs. The Indonesian government increased its subsidy to Rp2,000 per liter for diesel fuel, which is locally known as ‘Solar’. Coordinating Minister for Maritime Affairs Luhut Binsar Pandjaitan said tourists were currently starting to visit tourism destination Gili Trawangan, Lombok, West Nusa Tenggara after numerous devastating earthquakes hit the region. As part of our Jakarta Globe Reading Club’s “Reading Indonesia” event on Saturday, Sept. 8, at Maxx Coffee in Lippo Mall Kemang, South Jakarta, we’re publishing this list of 30 books on Indonesian history, politics, economy, culture and literature that might help you gain a deeper understanding of the sprawling archipelago of more than 18,000 islands and 267 million people – and its long and complex story. More officials are believed to have been involved in a conspiracy to fake land certificates in East Jakarta and Bekasi, West Java, police said on Thursday. Some 49 female students at two pesantren (Islamic boarding schools) in Banjarbaru, South Kalimantan, are being quarantined after being diagnosed as rubella positive, according to the local health agency. The government has planned to issue a regulation that would require that oil companies sell their crude oil to state energy holding company Pertamina as part of an effort to reduce imports. Through its subsidiary, PT Pertamina Hulu Energi (PHE), state-owned oil and gas holding company Pertamina has officially taken over the operatorship of the Southeast Sumatra (SES) Oil and Gas Block from CNOOC SES Ltd.
Indonesian Minister of Agriculture, Andi Amran Sulaiman, promised to focus on four targets related to maintaining food security until 2019. The Asian Games in Jakarta came to a successful conclusion on September 2. Athletes from across Asia had offered a wonderful sports feast for the whole world. Three female junior high school students reportedly drowned on Wednesday afternoon in Lake Toba, Rianiate village, Samosir regency, North Sumatra. The Bangka Belitung provincial government initiated a clean-up against civil servants (PNS) convicted of corruption. As a result, it has terminated 22 people that were named convicts of corruption. Former terrorist convict Yudi Zulfahri said that radical idea that is heavily linked to terrorism originates from intolerance. The police have captured 29 teenagers who were involved in a violent fight between students—also known as tawuran—that caused the death of a 16-year-old high school student from SMA Muhammadiyah. The life story of the former Jakarta Governor Basuki Tjahaja Purnama or Ahok will be made into a film. Drought has affected 22 districts and cities in West Java Province since August this year, causing water shortage. As many as 2,888 athletes from 41 countries have been registered for the Asian Para Games based on data received by the Organizing Committee (INAPGOC), but not all of them have to undergo classification because they have been established in the previous championships. 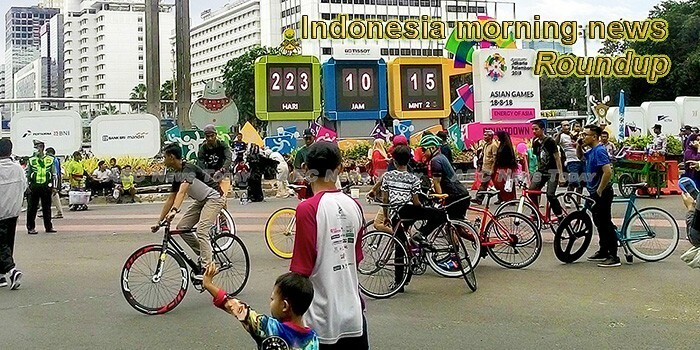 After successfully securing the 2018 Asian Games, the Jakarta Metro Police said they are ready to secure the 2018 Asian Para Games sports event in Jakarta and have begun their preparations. Indonesian President Joko Widodo (Jokowi) will undertake an official visit to South Korea on September 10-11, 2018, to strengthen economic relations. Indonesian President Joko Widodo (Jokowi) will visit Hanoi on September 11-12, 2018, to develop economic potential and expand market access between Indonesia and Vietnam. Indonesia has deported 40 Bangladeshis for violating regulations on immigration after previously they were detained in Pekanbaru, Riau. The perpetrator of bomb threat of the Islamic Hospital (RSI) of Sultan Agung Semarang mosque named Suryana bin Alibi was arrested by the Semarang Big City Resort Police Criminal Investigation Unit in collaboration with the Special Detachment (Densus) 88 Counterterrorism team. The National Police (Polri) Headquarters guarantees that the National Police will remain neutral when the 2019 legislative election and presidential election take place and create a conducive atmosphere to prevent conflict amid the community. Notwithstanding solid economic growth, low inflation and a proactive central bank, Indonesia finds itself in the same uncomfortable position it had during the 2013 emerging markets sell-off – Asia’s worst-hit market. Indonesia’s stock exchange plans to launch a dedicated technology section in 2019 to host initial public offerings (IPO) by startups, in the hope of landing a Go-jek listing. Whenever there’s a bout of emerging-markets flu, Indonesia catches it. Jakarta may be crying foul, because it looked as though the nation was inoculated. Indonesia’s government is proposing $US4 million in funding towards influencing Pacific Island countries to change their position on Papua. Indonesian processors are hopeful a new agreement between their country and Qatar will see Qatari businesses invest to develop the shrimp industry in the Indonesian region of Aceh, reports Kontan. Indonesia morning news by AEC News Today is your one stop source for Indonesia news on matters of governance and policies affecting Asean business communities and is published M-F by AEC News Today: Governance, not government; policies not politics.